Fall is coming, it becomes cooler and cooler recently, I don't think it's a good time to go to beach. So what are we going to do in this season? How about go to the hot spring? There is a well-known hot spring near Kenting, called " Sihchongxi". If you drive, it only takes about 20 mins. People who lives in Kenting like me always likes to go to visit there and soak the hot spring. "Sihchongxi Hot Springs" is a small spot than any other hot springs in Taiwan, there are some restaurants and hotels on a small street. 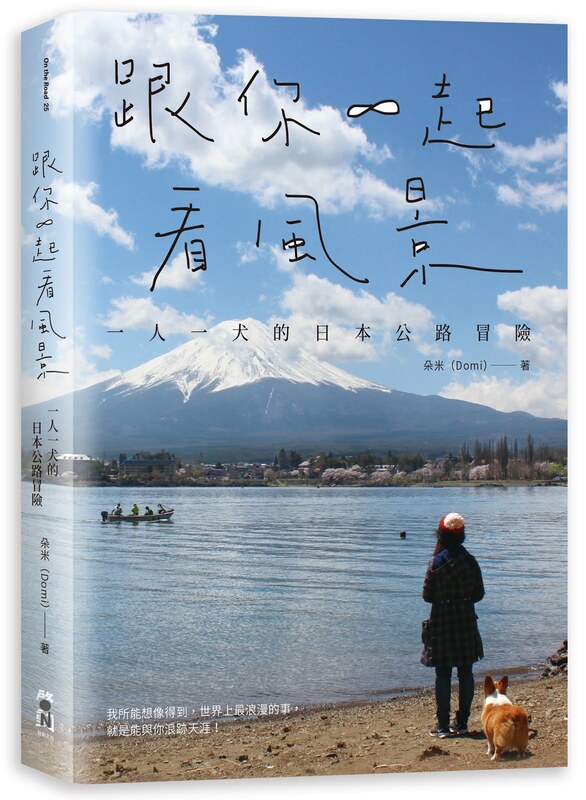 Today I'm going to show you one of it - "Quin Quan Hot Spring Hotel". Go straight down the NO.26 Road from Kenting, you will arrive "Checheng Town", then turn right when you see this sigh. (between the police officer and a "Hi-Life" convenience store) After turning, keep going straight down the road, you will arrive at Sihchongxi Hot Springs after 10 mins. 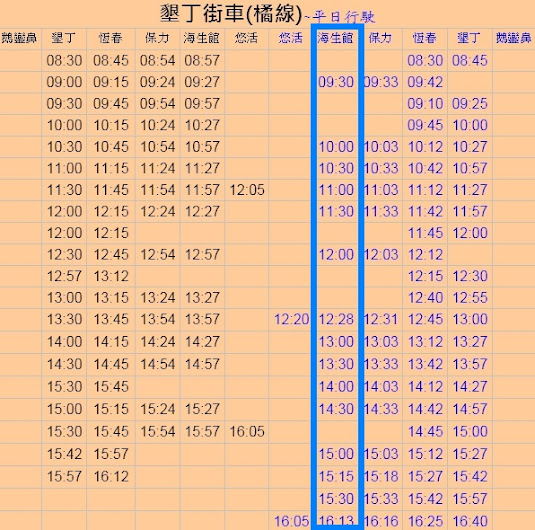 You can rent a car or motorcycle to go to Sihchongxi, it will take about 20 mins. 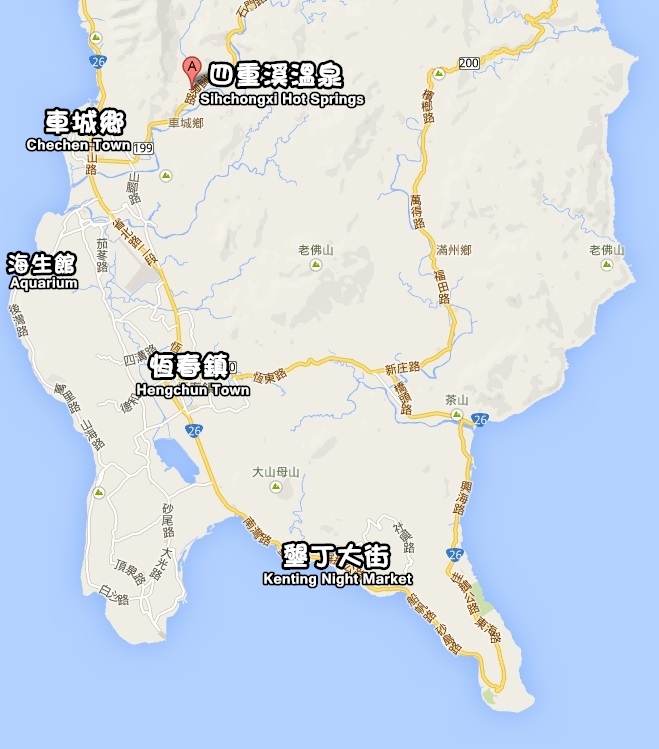 Or you can also take the bus "Kenting Street Bus" to there, it will take about 45 mins. 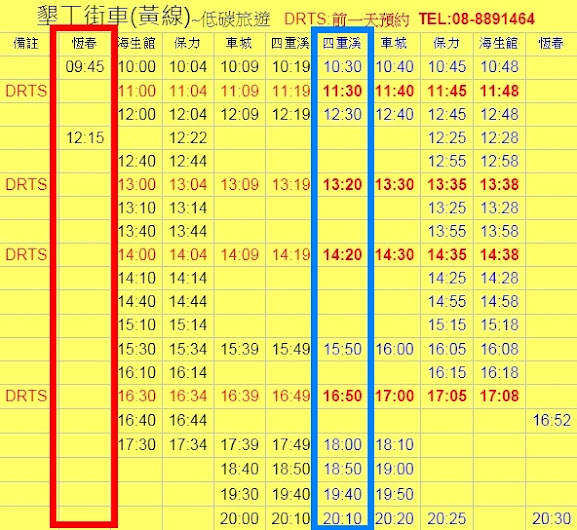 Red frame: There are only 2 buses to Sihchongxi from Kenting in a day, you have to take the bus at the bus station in Hengchun Town. As you can see, it's 09:45 and 12:15. Blue frame: The buses from Sihchongxi is all go to the aquarium. You have to transfer a bus at aquarium to go back to Hengchun Town or Kenting main street. p.s. : "DRTS" means you have to make an appointment to the bus station or they won't send off the bus. The "Quin Quan Hot Spring Hotel" is just in the small lane next to 7-ELEVEn. It's easy to find, you can ask people around if you can't find it. There are a lot of parking spaces in front of the hotel, so you don't actually have to worry about where to park. It's an old and famous hotel, it has a very long history over a hundred year, and it's built of Japanese style. There is a Japanese garden inside. The price of a private room is about NT 800 for 2 person, you have 90 mins to use on weekdays, and 60 mins on holidays. The hallway is also very Japanese style, and the doors of the rooms are all traditional Japanese doors, made by papers and woods. The look inside is like this, they also offer towels and hair-dryer. The price of public pools is NT 250 for each people, you must to wear a swimming suit to soak, they don't offer towels in public pool so don't forget to bring yours. There are hair-dryers and showers here. If you ask me to suggest you which one to choose, I would like to tell you to try the public pools. The space is very large, clean, and no time limit. There are cold water pools and hot water pools, and also the massage shower. The kind of hot spring in Sihchongxi is transparent and no smell, and it's good for your skin and heath. Remember to take a rest between your soaking at least every 15 mins, it's not good if you stay in the hot spring too long. After soaking, you can have some foods in their restaurant, the foods here are really good. If you are a dessert lover like me, I suggest you to try the red beans sweet soup and the Japanese green ice-cream, both them are really really delicious, I must to eat it every time I come here. Besides, you can also get some special foods on the street. The most well-known food here is the "mutton hot pot", Taiwanese people usually likes to eat it in wintertime. After having a hot spring, eat the hot pot is the most enjoy thing in the winter! The mutton rice also tastes good. There is another special food in Sihchongxi - "Hot Spring Egg", it's made by hot spring, it's really special, you should give it a try next time when you come here. Let's soak the hot spring in the winter!